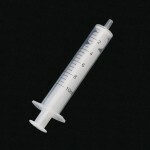 2-piece sterile disposable plastic polypropylene syringe with luer tip. Without needle. Individually packed. Volume: 2mL. Pack of 100. Volume: 5mL. Pack of 100. Volume: 10mL. Pack of 100.